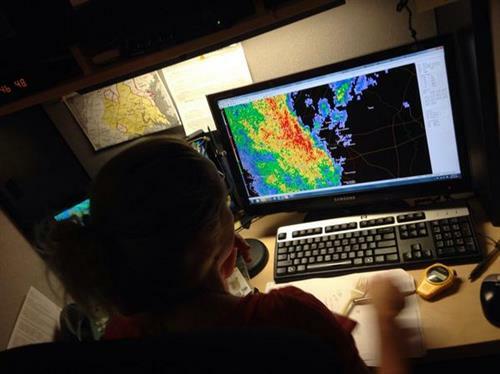 WASHINGTON - Rain and thunderstorms have dropped about 1 inch of rain across the listening area, with some spots receiving even higher amounts of rainfall. The storms also triggered three tornado warnings today. 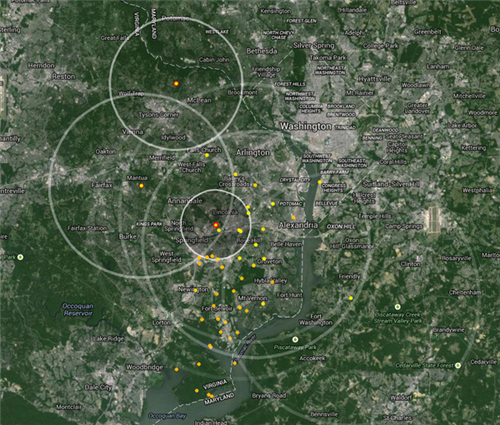 The most recent was for the Laurel, Maryland, area. 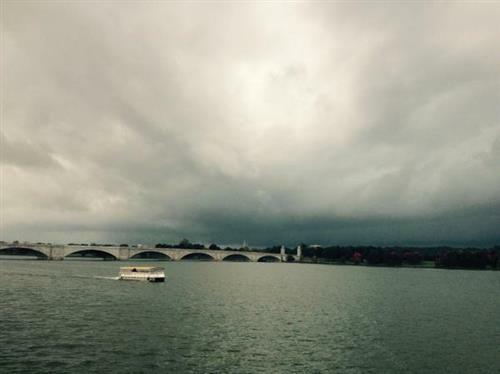 Early this morning, a tornado warning was issued for Virginia’s Clarke, Frederick and Warren counties and midday for D.C. and the inner suburbs. 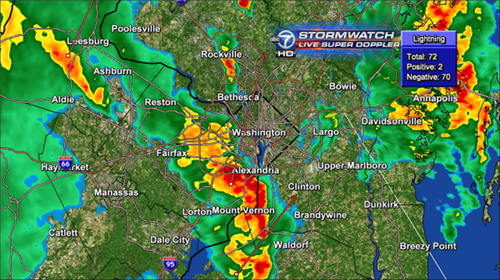 Temperatures have dropped as the storm has moved east of D.C.
Pepco - more than 400 mostly in Montgomery County. The heavy rains could trigger flooding as many areas have already received more than a half inch of rain with more on the way. 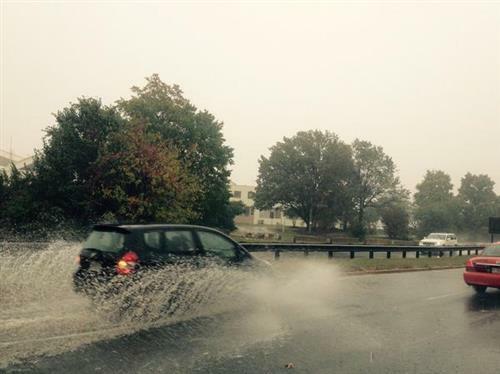 Drivers should be wary of high water on roads as they travel home this afternoon. However the flood watch has been cancelled for much of the region. 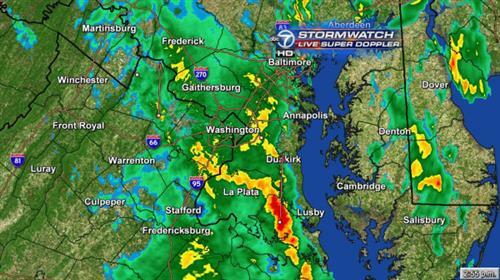 Prince George's and Anne Arundel counties still remain under a flood watch until 8 p.m. 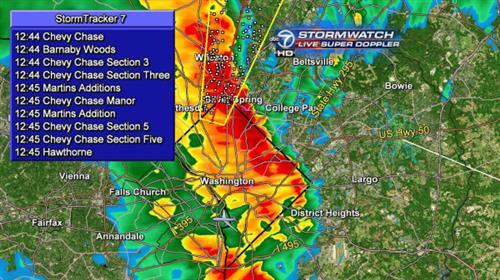 The storms have knocked down some trees down in the WTOP listening area and power outages have been reported. The rain is expected through the afternoon and into the evening. It is moving from the South to the North-Northeast. The forecast calls for the rain to move out overnight. Thursday will be seasonable and near 70 with a stray shower. Sunshine returns Friday. 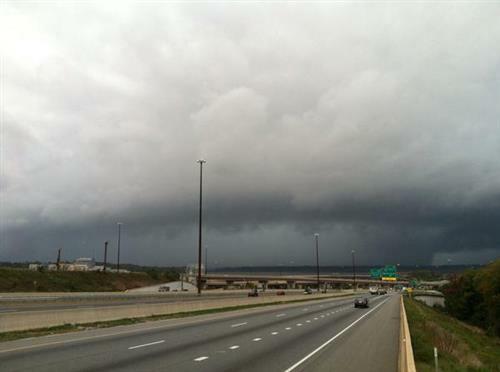 A Tornado Warning had been issued for Howard County in Maryland until 1:30 p.m. The storm is heading north toward the Interstate 95 corridor. Thanks! 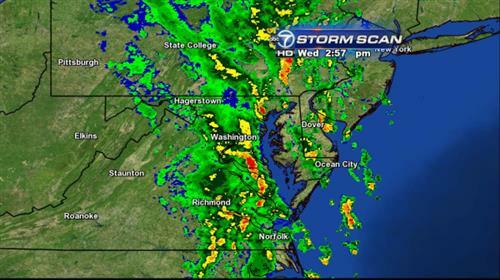 RT@kenvogel : Torrential in Dupont MT @ABC7Brian : No warnings-Flood Watch continues. 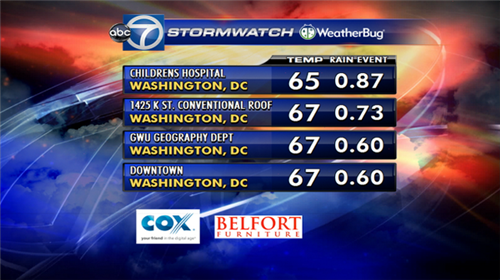 1" of rain fell in ALX & DC last half hour! 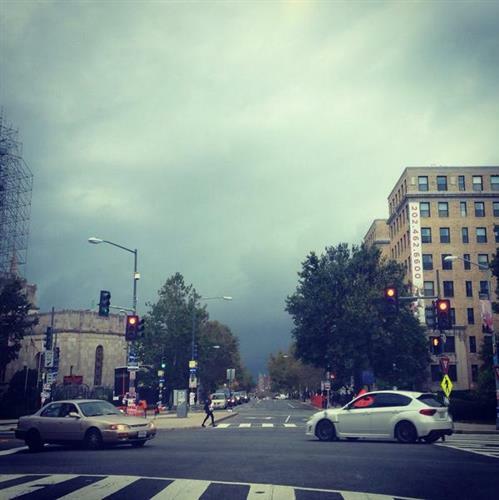 @WTOPTraffic is warning that red lights are flashing at some intersections in the District. 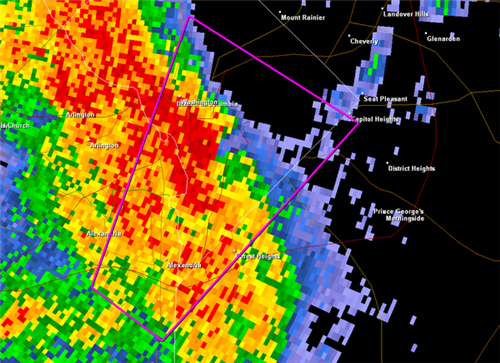 Tornado warning/ ground stop in effect for #DCA . Stay tuned 4 more info. Passengers advised to be aware of surroundings. 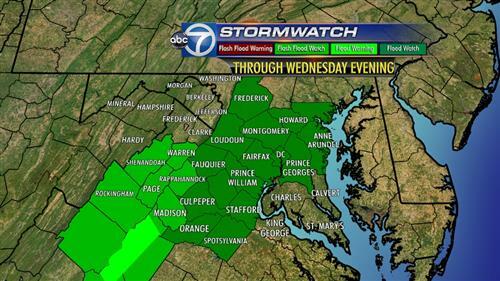 A flash flood watch (neon green) is in effect until noon and the flood watch is up until 8pm. Heavy rains will continue to move out of the south and to the north and north east through the morning hours. Still looking at heavy rains across the district – most likely after the lunch hour. The frontal system that is creating these conditions is crawling across our area this morning, dropping temperatures behind it. Winds will continue to be breezy today – and with some isolated cells, we could see some damaging wind gusts. We are expecting 1.00” - 3.00” of rain accumulation to fall across the region before this wraps up from the south and west to the north and east through the late afternoon and evening hours. Clouds skies overnight, winds will calm and temperatures will fall into the lower 60s. Tomorrow morning we may even get a little sunshine before that area of low pressure sitting over the Great Lakes brings some clouds and spotty rain showers our way. Temperatures tomorrow will top out in the lower 70s. Sunshine returns for Friday and Saturday but by Sunday, temperatures drop into the lower 60s and stay cool through the first part of next week. 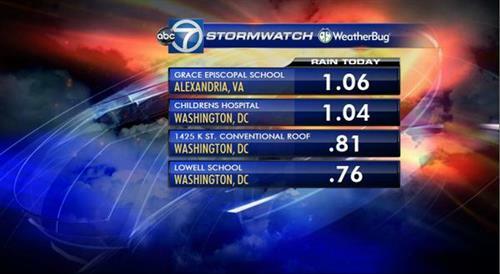 Rainfall total at CHO (Charlottesville Airport) so far today: 1.72".